Make a Square or Hexagon Tray Out of Scraps! 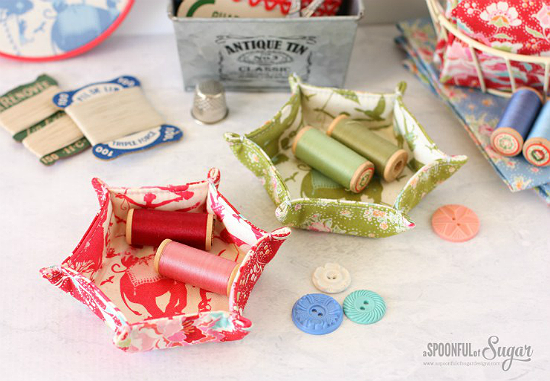 These pretty little fabric trays are perfect for storing small items that otherwise might get lost. Buttons, earrings, wonder clips or just about anything else will find homes in them. The trays are easy to make so you can quickly stitch up several for use around the house. They’ll be fun little gifts, too. The hexagon tray featured here is 3″ across the base at the widest point and 4 1/2″ across the top at the widest point (from tip to tip). You can make it any size you want by changing the size of the beginning hexagon. The size was adjusted up and down by @raspberryrainbow to create a lovely stacking set of three, shown below. The tutorial, from the ladies at a Spoonful of Sugar, is well illustrated and easy to follow. Click here for the free “Hexagon Fabric Tray” tutorial. Click here for the Hexagon Tray template. A second tray from the same designers is square and just as easy to make. 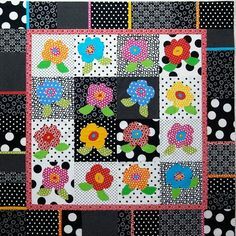 It’s pieced from 2 1/2″ squares, although you can also make it from a solid piece of 6 1/2″ square fabric. Trays from Beech Tree Lane Handmade. Trays made from 5″ squares. Learn more. The finished tray is 3 1/2″ x 3 1/2″ at its base, and is 1 1/4″ high. Adjust the size by starting with a larger or smaller pieced or solid square. Click here for the free “Patchwork Fabric Tray” tutorial.